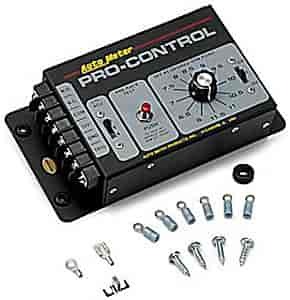 The Pro-Control can be used as a rev-limiter, air shift activator, or nitrous oxide trigger. As a rev limiter, it guards against over-revving by allowing 100% power until reaching the pre-set rpm level. ''Ignition Interrupter'' models (without reset button) interrupt power for a fraction of a second. ''Shut-Down'' models (with reset button) are for supercharged (blown) engines. This unit shuts off engine completely until reset. Hi, can this 5302 be used with a mallory super-mag lll , which has points. If not what unit can we use. Cheers Robert. Yes, this can be used with most magneto ignitions.